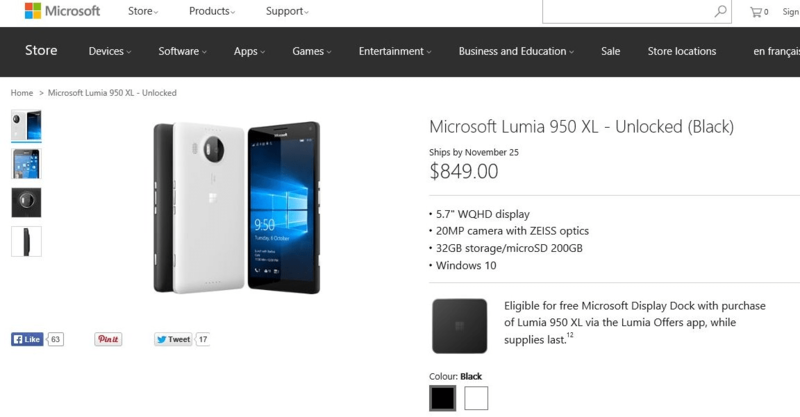 Earlier we saw the Microsoft store offering the Lumia 950 and 950XL unlocked for pre order in the USA, and now the Canadian branch has also made it available to purchase in advance of it’s November 25th shipping date. The 950, which has a 5.2 inch 2560 x 1440 display costs C$749 while the larger 950XL, with a 5.7 inch 2560 x 1440 resolution costs C$849, both come with free shipping and are available in black or white. According to the Microsoft store website pre orders of the Lumia 950XL entitles buyers to get the Microsoft Display Port free via the Lumia Offers app, but the 950 doesn’t appear to have this as part of the deal, which may be worth bearing in mind. For those of you in Canada who want to be among the first to get their hands on Microsoft’s new flagship Windows 10 Mobile you can pre order the Lumia 950 from HERE and the 950XL HERE.